The National Shooting Sports Foundation in the United States reports that 2012 was an historic growth year for recreational shooting in the US. The international practical shooting confederation (IPSC) also reports that membership continues to increase. Shooting the guns may be what attracts people to the shooting sports but most shooters would agree it’s the people that keep them involved. Whether you shoot in leagues, in competition, or simply spend time at a range, target shooting is often a social event. Whether target-shooting for occupational training or recreation, firing a gun involves the risk for noise induced hearing loss, but what about observers - other people at the firing range? There is great information coming from a group of researchers most of whom are themselves recreational shooters. These researchers are Amir Khan from the National Institute for Occupational Safety and Health (NIOSH); Jacob Sondergaard of G.R.A.S. Sound and Vibration; Greg Flamme, PhD, of Western Michigan University; James Lankford, PhD, of Northern Illinois University; Michael Stewart, PhD, of Central Michigan University; Deanna Meinke PhD, of University of Northern Colorado; Don Finan, PhD, of University of Northern Colorado; and CAPT William Murphy, PhD, from the US Public Health Service and NIOSH. All of these researchers are members of the National Hearing Conservation Association (NHCA) Recreational Firearm Noise (RFN) task force and are collectively known as “The Rudyard Gang” (Figure 1). They have presented some of this new research at the 2012 and 2013 NHCA Conferences and reported it in scholarly journals. The NHCA and the National Shooting Sports Foundation lists the following factors that increase the risk of noise induced hearing loss. Shooting in an indoor firing range or from an enclosed structure like a hunting blind - Hard surfaces can redirect the sound energy wave back at the shooter and by-standers, increasing the noise energy reaching the ear. The caliber of the firearm – Large calibers can generate higher energy sound waves. Short barreled guns – Shorter barreled guns bring the muzzle, which is the primary noise source, closer to the ear. Muzzle brakes and ports – Designed to decrease recoil, these modifications increase sound exposure by sending the shock wave back toward the user and any by-standers instead of out of the front of the muzzle. Ammunition – The material, amount of gun powder and other factors. Environment – There are many factors in the environment that may affect the exposure level of the shooter and any by-standers. Distance – The distance from the noise source is a basic principal of noise control. This variable is discussed in the remainder of this article. The right-handed shooters fired 54 different guns including pistols, shotguns and rifles. The firearms and ammunition used are all small caliber and are commercially available in the US. The environment was an outdoor range in a flat, grassy field surrounded by woods. Figure 2. The peak sound pressure levels ranged between 145 and 173 dB for a microphone close to the left ear of the shooter. (Used with permission from Murphy, William J. et. al 2012). The peak pressure levels were measured between 145 and 173 dB SPL at the shooter’s left ear. Figure 2 shows that most of the guns produced peak exposures above 155 dB SPL and all were above the recommended limit of 140 dB peak SPL. The rifles produced most of the measures at or above 163 dB. The majority of the pistol shots resulted in peak exposure levels between 158 and 168 dB Peak. Any of these single peak pressures can be hazardous to hearing. Figure 3. Histogram of LAeq8 Levels at the left ear of the shooter for various firearms. (Used with permission from Murphy, William J. et. al 2012). However, depending on all the variables mentioned above and on individual susceptibility to noise-induced hearing loss, both the level of peak sound exposure and the risk for hearing loss is difficult to predict. The safest rule is to use hearing protection for every shot. To show the hazard level of each shot, the researchers converted these peak sound pressure levels to an A-weighted, 8-hour equivalent of continuous energy. Using 75 dB as a safe exposure, Figure 3 shows that for almost all of the rifle measurements and most of the pistol measurements, a single shot from many of the guns tested would result in an equivalent exposure greater than 80 dBA and many above the occupational Action Level of 85 dBA. Figure 4. The 85 dBA foul line for 25 shots as the number of shooters increases. A 15 meter foul line (observers no closer than this) is adequate for most guns with up to 16 shooters spaced with 1 meter between them for 25 gunshots. The shooters, of course, must wear hearing protection. Safety is naturally “job one” at shooting ranges. Thank you to the Rudyard Gang for this project to provide evidence-based recommendations for extending that culture of safety — in terms of protection from noise-induced hearing loss — to both occupational and recreational firearms users and observers to keep our hearing safe. 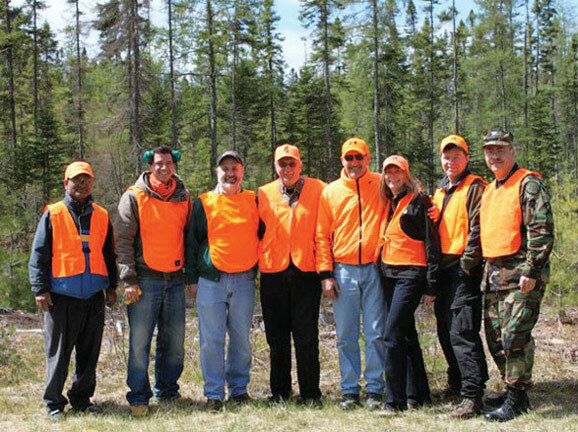 Special Thanks to: The NHCA Recreational Firearms Noise Task Force was formed in 2007 to research firearm noise, its contributions to noise induced hearing loss and develop recommendations for civilian hunters and shooters to preserve their hearing. The task force members contributing to this effort Caroline Dektas, Gregory Flamme, Donald Finan, James Lankford, Deanna Meinke, William Murphy, Michael Stewart, Edward Zechmann. For further information visit the NHCA Recreational Firearms web page. Lay Language paper and presentation from the Kansas City ASA meeting, Noise exposure profiles for small-caliber firearms from 1.5 to 6 meters. Authors: Murphy-WJ; Flamme-GA; Zechmann-EL; Dektas-C; Meinke-DK; Stewart-M; Lankford-JE; Finan-DS. Dr. Theresa Y. Schulz is the Hearing Conservation Manager for Honeywell Safety Products, the manufacturer of Howard Leight® hearing protection products. Dr. Schulz is a past President and has been an active member of National Hearing Conservation Association [NHCA] for 24 years. She is also a past Chair of the Council for Accreditation in Occupational Hearing Conservation [CAOHC]; a certified member of the American Speech- Language-Hearing Association [ASHA]; a fellow in the American Academy of Audiology [AAA]; and a member of the Air Force Audiology Association [AFAA]. Dr. Schulz received her B.S. in Communication Disorders and M.A. in Audiology in from the University of Texas at Austin, and her PhD in Hearing Science from Ohio State University. Dr. Schulz served in the United States Air Force for over 20 years as an audiologist, and was recognized as U.S. Air Force Outstanding Audiologist of the Year in 1989 and 1998. She also received the Elizabeth Guild Award for Contributions to Military Hearing Conservation in 1996. For more information, contact: William J Murphy, PhD, Captain, USPHS, National Institute for Occupational Safety and Health (email: wjm4@cdc.gov) or Gregory A Flamme, PhD, Western Michigan University (email: greg.flamme@wmich.edu).